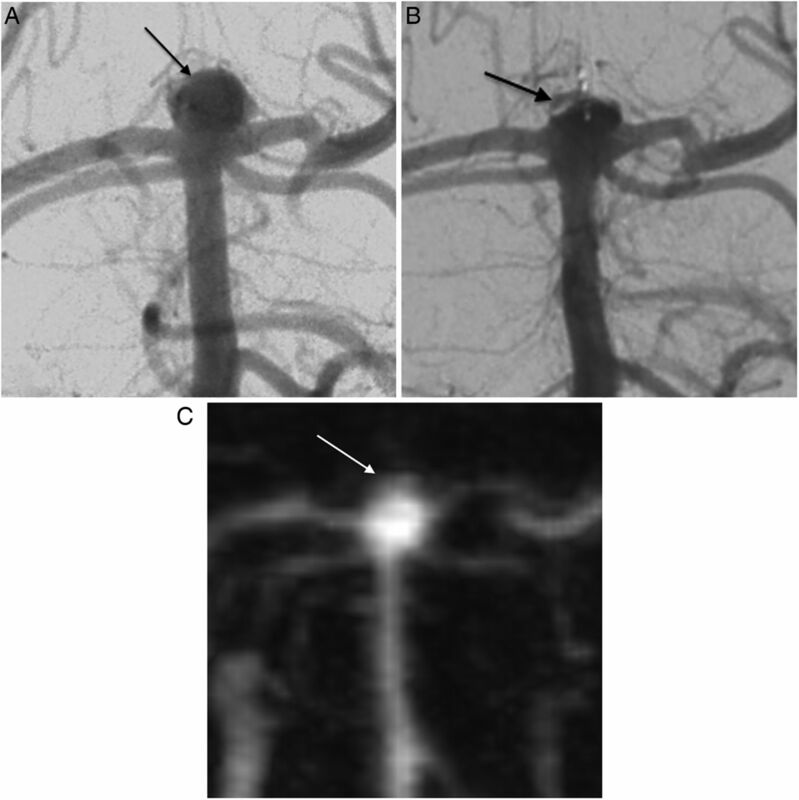 Objective To compare contrast-enhanced MR angiography (CE-MRA) and DSA for the follow-up of intracranial aneurysms (IAs) treated with the Woven EndoBridge embolization system DL (WEB DL; Sequent Medical, Aliso Viejo, California, USA). Materials and methods We retrospectively identified all patients treated with a WEB DL between November 2010 and February 2013 in 2 hospitals. The IA occlusion was graded on follow-up CE-MRA and DSA by 4 independent readers and by 2 readers reaching a consensus, respectively. Interobserver agreement for MRA and intertechnique agreement was evaluated by calculating linear weighted κ. Results Fifteen patients with 16 IAs were included. Mean delay between MRA and DSA was 2 months (range 0–16 months). Interobserver agreement for MRA was substantial to almost perfect (κ=0.686–0.921; mean κ=0.809). Intertechnique agreement was moderate to substantial (κ=0.579–0.724; mean κ=0.669). Only three out of five inadequately occluded IAs were detected by MRA. Conclusions CE-MRA is a useful tool for the follow-up of IAs treated with a WEB DL. However, early follow-up with DSA remains mandatory to detect inadequately occluded IAs. The Woven EndoBridge embolization system DL (WEB DL; Sequent Medical, Aliso Viejo, California, USA) is a recently developed intrasaccular flow-disruption device for the treatment of wide-necked bifurcation intracranial aneurysms (IAs)1 that remain challenging to treat endovascularly. The device has two compartments with a mesh structure resulting from microbraided nitinol wires. The initial results for clinical outcome in animals1 and humans2–7 are encouraging. However, IAs are evolving lesions and may recur even after complete occlusion. Therefore, patients harboring treated or untreated IAs must receive long-term follow-up. DSA has been considered as the reference method for IA evaluation after coiling.8 However, DSA is associated with a low risk of permanent neurological deficit9 that becomes significant if repeated examinations are carried out, such as for IA follow-up. MR angiography (MRA) has become the preferred method for the non-invasive follow-up of endovascular treatment (EVT) of IAs10 ,11 because it is not associated with ionizing radiation, and has fewer coil-induced artifacts than CT angiography, and it provides a good diagnostic performance for the detection of recanalizations. Both time-of-flight (TOF) and contrast-enhanced (CE) MRA are usually performed for the follow-up of coiled IAs. However, CE-MRA provides better visualization of the residual intra-aneurysmal flow12–14 and it might be of interest when an intrasaccular flow disrupter is placed within the aneurysmal sac. To the best of our knowledge, no data are available for the follow-up of IAs treated with WEB DL by MRA. This study aimed at evaluating the performance of CE-MRA for the follow-up of IAs treated with a WEB DL device. The study was approved by our local ethical committee. We retrospectively identified in our prospectively maintained database all patients treated with a WEB DL device between November 2010 and February 2013 in two hospitals. Our follow-up protocol for IAs treated with the WEB DL device includes contemporaneous DSA and MRA at 12 months. MRA was performed on a 1.5 T device (Achieva 15; Philips Medical Systems, Best, The Netherlands) using a 16-element, phased-array neurovascular dedicated coil. The MRI protocol included sagittal T1-weighted, axial T2-weighted and diffusion-weighted imaging CE-MRA. For CE-MRA, 18 mL of gadoteric acid (Dotarem 0.5 mmol/mL; Guerbet, Aulnay-sous-Bois, France) was injected at 2.5 mL/s. The scanning parameters were TR/TE 4.7/1.5 ms; flip angle 25°; band width 431 Hz/pixel; k space profile Centra; acquisition pixel size 0.74 mm×0.74 mm; field of view (FH, AP, LR) 320 mm×207 mm×120 mm; SENSE factor 2 (AP)×1.8 (RL); slice thickness 0.8 mm reconstructed every 0.4 mm; reconstruction pixel size 0.60 mm×0.60 mm; 300 sagittal slices; acquisition time 61 s. The scanning acquisition was interactively started when the origin of the common carotid arteries began to enhance on a time-resolved coronal fluoroscopic dynamic sequence, itself initiated together with the contrast material injection. Digitalized subtraction angiography studies were performed on either a biplane flat-panel digital subtraction unit (Allura Xper 20/10; Philips, Best, The Netherlands); n=12 or on a single plane flat-panel digital subtraction unit (Infinix VF-i/SP; Toshiba, Tokyo, Japan); n=3. Selective injections of a non-ionic iodinated contrast material (iodixanol 270 mg I/mL, Visipaque 270; GE Healthcare, Princeton, New Jersey, USA) into the artery harboring the aneurysm were performed with a power injector, including frontal, lateral, oblique, and working projections acquired at two images per second. DSA was completed by 3D rotational angiography (3DRA) in seven patients. reached a consensus for each IA. Two senior neuroradiologists, one with more than 10-years’ experience and one with 2-years’ experience in vascular neuroradiology, reached a consensus about IA occlusion on DSA. On both MRA and DSA, the occlusion was graded according to the Raymond classification scale: complete occlusion (grade 1), neck remnant (grade 2), or incomplete occlusion (grade 3).15 The residual recess, inherent to the WEB DL shape (figure 1) was considered as a complete occlusion. Good correlation between DSA and contrast-enhanced MR angiography (CE-MRA): proximal recess in an unruptured middle cerebral artery (MCA) aneurysm. (A) Pretreatment frontal DSA showing an irregularly shaped wide-necked right MCA intracranial aneurysm (IA) (arrow). (B) Post-treatment frontal view showing adequate occlusion of the IA with opacification of the proximal recess of the device (arrow). (C) Post-treatment frontal view on CE-MRA depicting the proximal recess as well (arrow). Seventeen patients with 18 IAs were identified. Two patients were excluded: one patient who refused to undergo imaging follow-up and one in whom MR control did not include CE-MRA. The final study population consisted thus of 15 patients with 16 IAs. There were nine women and six men with a mean age of 53 years (range 35–65 years). The mean IA diameter was 9 mm (range 5–14 mm). There were 15 wide-necked IAs and one small-necked IA. Nine IAs were located on the middle cerebral artery bifurcation, three on the tip of the basilar artery, one on the internal carotid termination, one on the posterior inferior cerebellar artery, and two on the anterior communicating artery. All but one WEB DL treatments were performed for unruptured IAs. One ruptured wide-necked middle cerebral artery bifurcation IA was treated in the setting of subarachnoid hemorrhage. EVT consisted of WEB DL placement alone in nine IAs. Adjunctive devices were used in seven IAs including a stent alone in two cases, coils alone in three cases and a stent and coils in two cases. The mean delay between MRA and DSA was 2 months (median 0 months; range 0–16 months). Aneurysm occlusion according to imaging modalities and readers is summarized in table 1. Interobserver agreement for MRA was substantial to almost perfect (κ=0.686–0.921; mean κ=0.809). Interobserver agreement is shown in table 2. Occlusion was the same for all readers in 12 IAs. There was at least one divergence in four IAs, including two treated with the WEB alone and two treated with adjunctive devices (coils, n=1; stent, n=1). Intertechnique agreement was moderate to substantial (κ=0.579–0.724; mean κ=0.669). Overall, disagreement occurred between DSA and CE-MRA in four IAs, including two treated with the WEB alone and two treated with adjunctive devices (coils, n=1; stent and coils, n=1). Among five IAs that were graded 3 on DSA, two were graded 3 by all MRA readers, one was graded 2 and 3 by one and three readers, respectively, and two were graded 2 by all readers. Among the four IAs that were graded 3 based on the consensus reached by MRA readers, three were graded 3 and one was graded 2 on DSA. Intertechnique agreement is shown in table 2. Our results show that CE-MRA has good reproducibility to evaluate IA occlusion after EVT with the WEB DL. Although CE-MRA correlates satisfactorily with DSA, it failed to identify two out of five inadequately occluded IAs. For this reason, CE-MRA alone might not be sufficient for the early follow-up of IAs treated with the WEB DL device. The patients on our study had IAs17 ,18 with a mean diameter of 9 mm. This might increase the sensitivity of CE-MRA because recanalizations in IAs <4 mm are probably more challenging to detect. However, to date, WEB DL devices are not available for sizes <4 mm so that it is probably not a limitation in this indication. Although MRA is now considered as the preferred method for the non-invasive follow-up of coiled IAs,10–15 ,19 ,20 some uncertainty remains about whether CE-MRA or TOF-MRA should be preferred.10 We assessed only CE-MRA for several reasons. First, some authors have reported better performances with CE-MRA for the detection and accurate characterization of remnants or recurrence after IA coiling.12–14 Second, as the WEB DL works as a flow-diverting device,1 residual flow within aneurysm might be turbulent and generate some signal loss on TOF images. Finally, we wanted to evaluate a single MR technique rather than combined CE-MRA and TOF-MRA to obtain more unequivocal results that might more clearly affect our daily clinical practice. We assessed aneurysm occlusion with the grading scale that we use in daily practice.15 Although specific occlusion grading scales have been proposed for aneurysms treated with a WEB device,4 ,21 they have not yet been validated on a large scale. Although the performance of 3 T MRA has been reported to be better than that of 1.5 T MRA for the follow-up of coiled IAs for aneurysm remnants’ classification13 and coil visibility,22 we evaluated only 1.5 T MRA because it is more accessible and it corresponds to our daily practice. Some data suggest that MRA provides a higher sensitivity than DSA to detect IA remnants or recurrences after coiling,19 although DSA is still considered as the reference method . This might not be the case for IAs treated with the WEB DL device. Indeed, the WEB DL generates few or no metallic artifacts on DSA. C-arm CT, available on the more recent angiographic suites allows a precise depiction of the WEB DL device during the deployment procedure23 ,24 and might be a useful tool for the early follow-up of WEB DL treatments. For these reasons, we have considered DSA as the reference method. Despite the rather short experience of some MRA readers, the interobserver agreement was substantial to almost perfect (figures 1 and 2). This is in agreement with previously published data for the follow-up of embolized cerebral aneurysms, which reported excellent agreement between readers (κ=0.779).25 As the WEB DL device generates fewer artifacts than coils, it might be expected that CE-MRA provides at least a similar performance. 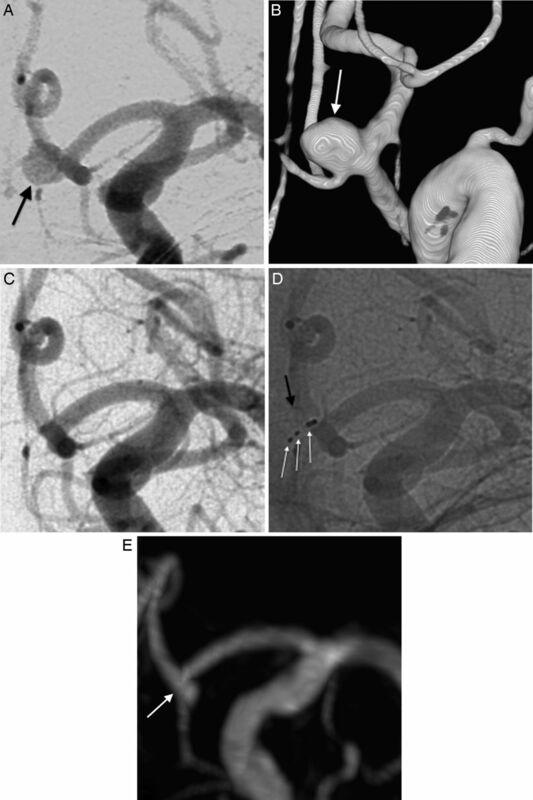 Good correlation between DSA and contrast-enhanced MR angiography (CE-MRA): complete occlusion of an unruptured anterior communicating (ACom) aneurysm. (A and B) Pretreatment frontal view on DSA (A, arrow) and oblique view on three-dimensional rotational angiography (B, arrow) showing a wide-necked ACom intracranial aneurysm. (C and D) Post-treatment frontal view on DSA (C) and unsubtracted angiography showing a complete occlusion. The unsubtracted image (D) depicts the three radiopaque markers (white arrows) of the WEB DL as well as the silhouette of the device (black arrow). (E) Post-treatment frontal view on CE-MRA showing complete occlusion (arrow). Proportions of disagreements in the subgroups of IA treated with or without an adjunctive device were similar (n=2/7 and 2/9, respectively). The overall agreement between DSA and CE-MRA was moderate to substantial. There was no difference of more than one occlusion grade between the two techniques. However, MRA accurately identified only three out of five inadequately occluded IAs (figure 3), which is a major limitation, as it affects the residual bleeding risk and the potential need for re-treatment. Several factors may explain this limitation. 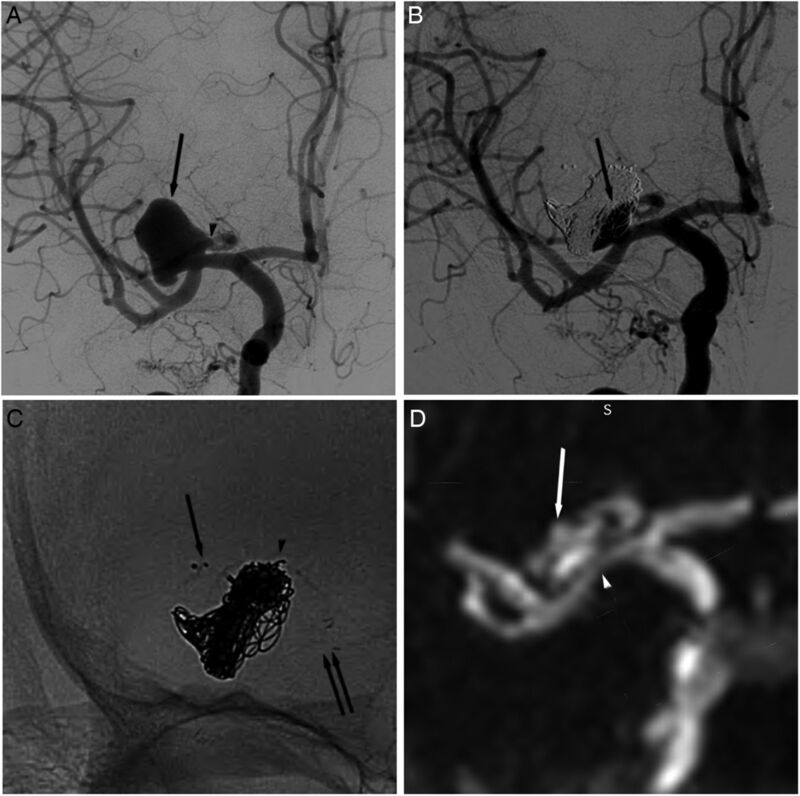 Discordance between DSA and contrast-enhanced MR angiography (CE-MRA): incomplete occlusion of an unruptured basilar tip intracranial aneurysm (IA). (A) Pretreatment frontal DSA showing an irregular shaped wide-necked IA of the basilar tip (arrow). (B) Post-treatment frontal view showing incomplete occlusion of the IA with opacification of the proximal compartment of the device (arrow). (C) Post-treatment frontal view on CE-MRA showing opacification at the neck of the IA (arrow). Because CE-MRA does not allow identification of the compartments of the device, this was erroneously interpreted as a neck remnant by all CE-MRA readers. First, DSA—including unsubtracted images and, in seven patients of our series, 3DRA or C-arm CT23 ,24—provides a better visualization of the WEB DL. This enables a better classification of residual opacification at the neck as proximal recesses (stable over time and considered as a complete occlusion),4 neck remnants, or incomplete occlusions. Second, we used an occlusion grading scale developed for coiled IAs15 that might not be optimal for the follow-up of WEB DL treatments. Much remains to be learnt about the clinical and anatomical outcome of IAs treated with the WEB DL devices. A specific occlusion grading scale may therefore be necessary to optimize the anatomical follow-up of IAs treated with the WEB DL device. Fiorella et al21 have recently reported a good interobserver agreement with DSA using such a specific scale—namely, the WEB Occlusion Scale. Third, our population included a high proportion (n=7/16) of IAs treated with an adjunctive device. These metallic devices create artifacts on CE-MRA and might decrease its performance. However, intertechnique disagreement proportions were similar in both subgroups (n=2/7 for IAs treated with an adjunctive device and n=2/9 for IAs treated without an adjunctive device). Indeed, CE-MRA is highly reliable for the follow-up of coiled IAs, and the presence of platinum coils probably generates few limitations.12–14 Although metallic stents induce more artifacts than coils, CE-MRA is also reliable for the follow-up of stent-assisted coiling.26 Larger studies will be needed to evaluate the effect of adjunctive devices on the performance of CE-MRA for the follow-up of IAs treated with a WEB DL (figure 4). 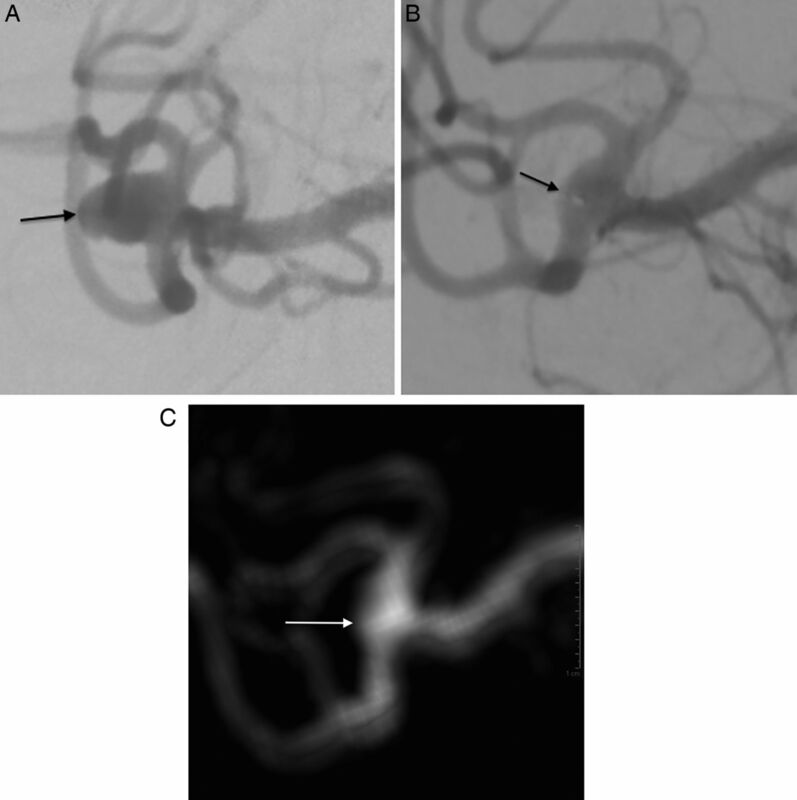 Discordance between DSA and contrast-enhanced MR angiography (CE-MRA): incomplete occlusion of an unruptured middle cerebral artery (MCA) aneurysm treated a WEB DL and adjunctive devices. (A) Pretreatment frontal view on DSA showing a large, wide-necked intracranial aneurysm (IA) (arrow) with a branch arising from the neck (arrow head). (B) Post-treatment frontal view showing incomplete occlusion of the IA (arrow). (C) Post-treatment unsubtracted frontal view allowing identification of the WEB DL (arrow), the coils (arrow head) and the stent in the MCA (double arrow). (D) Post-treatment frontal view on CE-MRA showing incomplete occlusion of the IA (white arrow). Note the signal loss due to the stent creating a false image of stenosis (white arrow head). For these reasons, we believe that the early follow-up of IAs treated with a WEB DL (as is the case for coiled IA) should include at least one DSA contemporaneously obtained with CE-MRA to serve as a baseline measure for further follow-up. This first CE-MRA should probably be performed at short- or mid-term follow-up (6 or 12 months) rather than immediately after treatment (with end-procedure DSA as reference) as the occlusion obtained with the WEB-DL device is prone to improve within the first weeks3 owing to cessation of anticoagulation/antiplatelet therapy and to the flow-disrupting effect of the WEB DL device. Further studies will be necessary to evaluate whether CE-MRA alone is sufficient to detect a worsening of occlusion in adequately occluded IAs based on combined early follow-up. Our study has several limitations. First, it was a retrospective study with a small number of patients. Second, we included some patients in whom adjunctive devices were used such as coils or stents, which might have affected the CE-MRA image quality. However, this experience represents our daily clinical practice of IA treatment, which may combine several endovascular and/or surgical techniques. This is the first study evaluating MRA for the follow-up of IAs treated with the WEB DL. It shows that CE-MRA is a reproducible, non-invasive imaging method for the follow-up of IAs treated with a WEB DL. However, because of a lack of sensitivity to detect inadequately occluded IAs, CE-MRA should not be performed as a standalone imaging control at early follow-up of IAs treated with the WEB DL. Further larger studies are necessary to validate these preliminary results.
. CE-MRA for follow-up of aneurysms post stent-assisted coiling. Interv Neuroradiol 2012;18:275–83. Contributors All authors contributed to study planning, data collection, and analysis. BM and BL contributed to writing of the manuscript. Ethics approval This study was approved by our local ethical committee “Comité d'Ethique Hospitalo-facultaire Hôpital Erasme” (reference P2014/061).